Sadly it is all too tempting for some people starting a new job to be a bit too keen to make a mark. 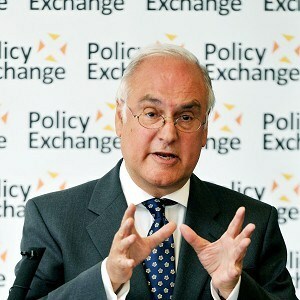 Michael Wilshaw the new Head of Ofsted or "Her Majesty's Chief Inspector" as he is also known appears to be doing just that with what he no doubt thinks is "tough" talking. First the satisfactory Ofsted grade is announced to be chaining to "needs improvement", then Wilshaw writes an article in the Guardian entitled I'll ensure our schools have no excuses for failure where he suggests that "last year's riots proved that the schools in our most deprived areas need leaders with drive and high expectations" and now, apparently, 5000 head teachers "lack leadership". Comment on Guardian Wilshaw Article by "Disappointed Ideaslist"
So far all you offer is the current teacher in-joke : "Daily whippings will continue until staff morale improves". That's not leadership. If anyone says to you that 'staff morale is at an all-time low', youknow you are doing something right." So when Wilshaw claims that 5000 Headteachers lack "leadership" then what he seems to mean is that they are not like him. Wilshaw has a particular approach to leadership. One which seems to involve telling everyone else where they are going wrong rather than offering support and guidance. And whilst sometimes poor staff morale does happen for a short while when trying to turn around a poorly performing school it is a necessary evil not an aspiration. What worries me is that this will put off good people becoming Headteachers. It is already a tough job and it is extremely difficult to recruit Heads in some areas. Wilshaw trades off his experience as Head (sorry Executive Principal) of Mossbourne Academy in Hackney. This is clearly a good school but has a number of significant advantages over neighbouring schools. Not least a brand new building and a very interesting admissions policy that involves children taking tests and a complicated banding arrangement. All this must ensure that only children with motivated parents apply for entry and quite possibly a higher average level of entry to other local schools. And remember, the old Hackney Downs school (aka "worst school in Britain") that Mossbourne replaced was a boys school whilst Mossbourne is mixed. Adding girls is a sure fire way to significantly improve attainment. I am also unsure how Wilshaw's "leadership" style would play in a primary school. I can't say personally that I think it that appropriate to secondary education but it is particularly inappropriate to primary. I mean this is the man who actually banned children from hugging each other, he would probably find the propensity of primary school children to climb all over each other impossible to bear and you can't just stand in front of four year olds and shout at them and tell them what to do! You're an intelligent guy. You know full well how your announcements about failing schools, poor teachers, the "smack of firm leadership" and all that cobblers, plays with the public. You know the impression it has created in the mind of the tabloid-reading public of a lazy, self-interested and incompetent workforce. Every time you write an article like this, you reinforce that. Every time you write stuff like this, you serve to not only demoralize the profession you claim to "lead", but you also damage the interests of students by turning away the very teachers who could best teach them. 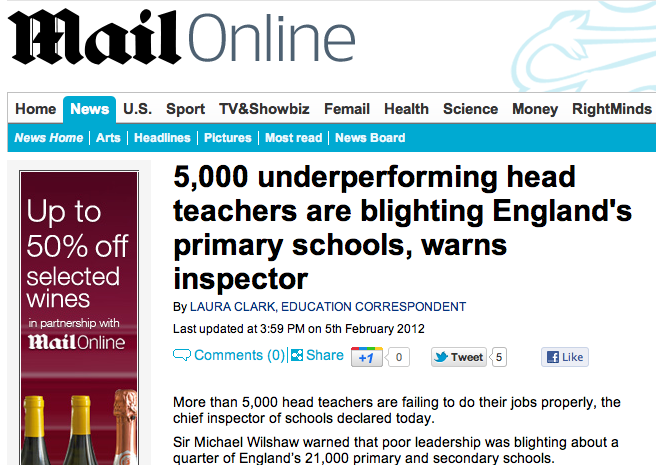 Wilshaw needs to look in a mirror before blaming 5000 Headteachers.